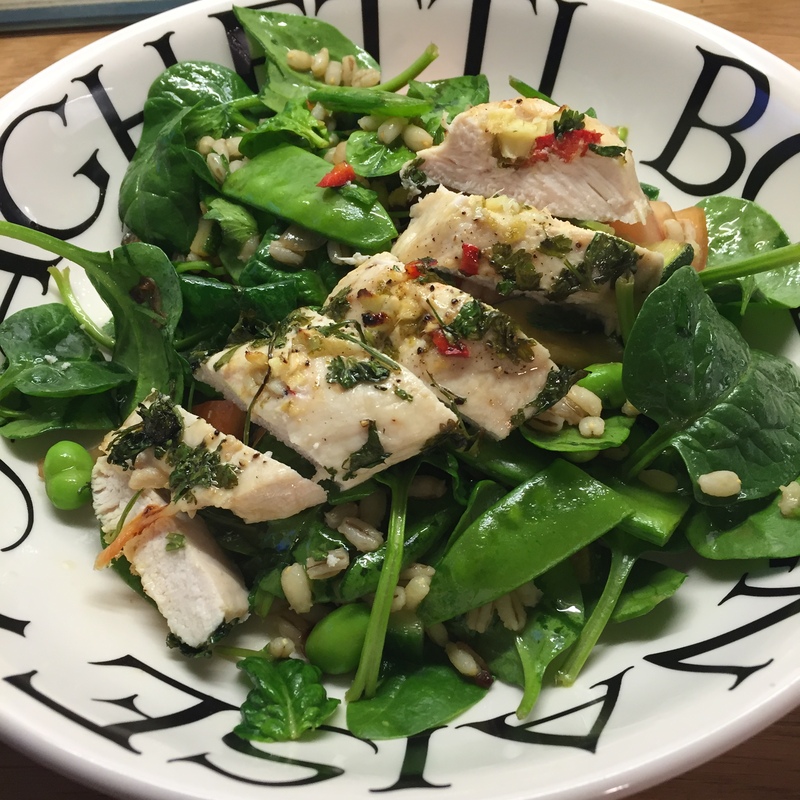 Spring has sprung so it’s time for slightly lighter suppers with plenty of salad leaves. 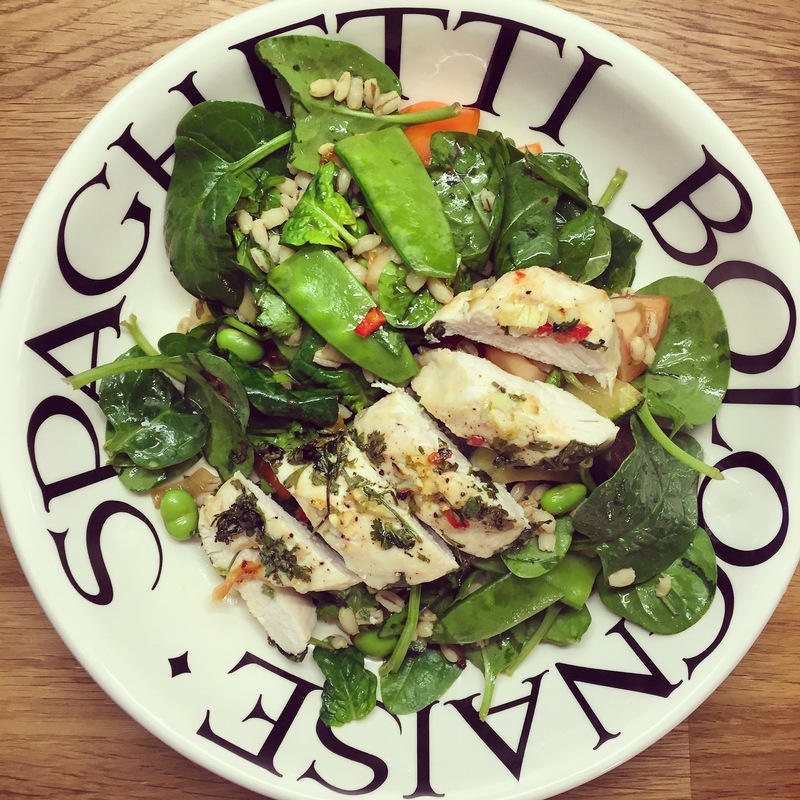 This zingy chicken salad recipe serves two people, and is full of flavour and colour. 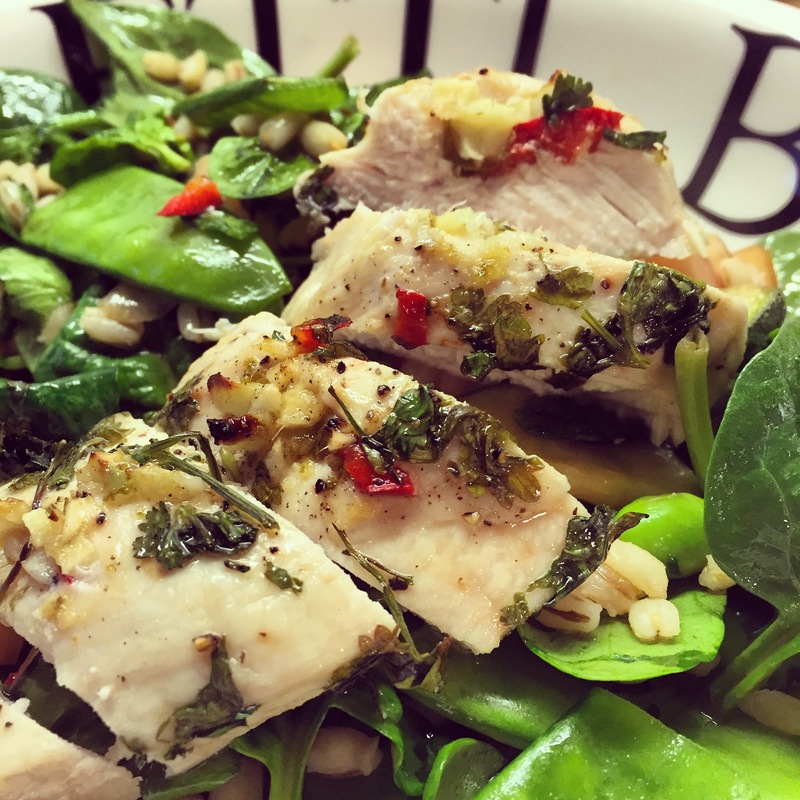 The chilli, lime, garlic & ginger combination works nicely with the slightly sweet salad dressing. Turn the oven to 200’c. To prepare the chicken, finely chop the garlic, ginger and chilli and place in a small bowl. Add the zest and juice of half a lime. Make three or four slits in the chicken breasts, depending on size, and stuff with the mixture. Sprinkle a little chopped coriander over the chicken breasts and use a basting brush to lightly cover them with the remaining mixture. Place the chicken in a roast tray, on top of a little tin foil, and cook in the oven for 20-25mins. Meanwhile, put 1 cup of pearl barley into a pan of boiling water and simmer for 25 mins. For the last 2 minutes add your cup of soya beans (if frozen). Fry up your shallot & courgette – just for a few minutes until slightly browned. In a large bowl add the spinach leaves, chopped tomato, cucumber, and mangetout. Once the barley is cooked through – it should be light and fluffy – allow to cool for 5 minutes and add to the bowl along with the shallots and courgette. Mix up your dressing in a small cup or jar and toss it through the salad leaves. Once the chicken is cooked, slice it into strips and arrange them on your plate on top of the barely salad. You can easily adapt this recipe to throw in whatever leaves and salad items you’ve got left in the fridge – try your own version at home.